Services: branding, print management, web design. 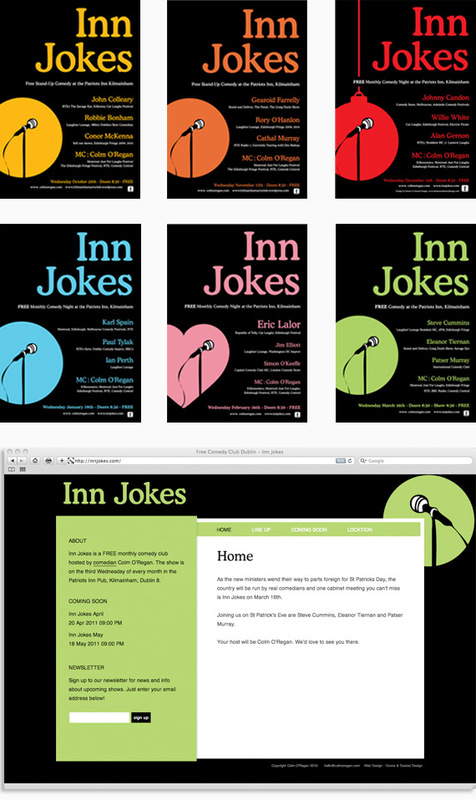 “I’m delighted with the branding curious design have created for Inn Jokes. Inn Jokes is a monthly comedy club in Kilmainham run by Colm O’Regan.To keep costs down Colm wanted a poster design that could be easily and quickly updated. As the posters are displayed in the same places every month each poster also needed an element of uniqueness.We used an image of a microphone in a spotlight as the main graphic for the poster. The spotlight changes to a relevant colour every month and sometimes even changes shape. We also designed a website for Inn Jokes. The colours are updated on the site every month to match the posters. The site is built in WordPress so Colm can easily add upcoming shows and information about the acts.